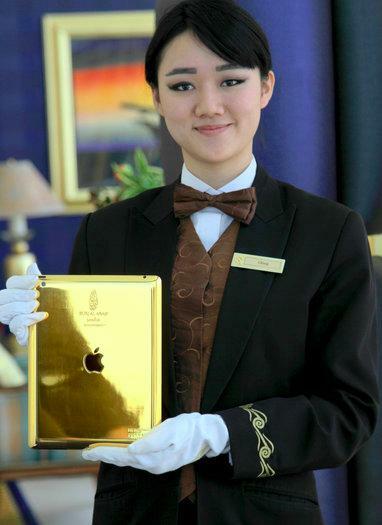 Apple's iPads are premium products with a premium price, but apparently not enough for one Dubai hotel, which provides its guests with 24-karat gold versions of Apple's popular tablet. The Burj Al Arab bills itself as "the world's most luxurious hotel," and according to the Los Angeles Times, is handing out the amenities to back up that claim. Guests checking into a room at the Burj  starting at $1,525 per night  receive a 24-karat gold iPad for use during their stay. Users of the device are currently limited to a preinstalled interactive customer experience, but the hotel is said to be working on expanding access to other applications. Gold & Co. London designs and manufactures the iPads exclusively for Burj Al Arab. The devices come engraved with the hotel's logo, Apple's logo, and the Burj's parent company's motto, "Stay Different." The hotel currently provides customers with a 16-gigabyte Wi-Fi third-generation iPad. Guests looking to take the luxury home with them, though, can stop into the Burj's Bespoke Boutique, which has 64GB versions of the device on sale for $10,200. The Bespoke Boutique also carries a gold iPad mini, gold iPhone 5, and a gold BlackBerry Q10.